The 2015 Corton Charlemagne Grand Cru, which comes from an exchange of grapes, from two parcels that are blended together (one on the Pernand side and the other Aloxe side), has a crisp linear bouquet with grapefruit and yellow plum aromas, fine mineralite underneath. The palate is well balanced with a slight waxy texture, a touch of bitter lemon and plenty of salinity on the finish. I just lacks a little complexity and drive at the moment, though maybe that will emerge by the time of bottling. The 2016 Corton Rognet Grand Cru was quite feisty and rich on the nose, perhaps missing the same composure as the Corton-Perrieres: hints of date infusing the red cherry and kirsch aromas. The palate is medium-bodied with sweet tannin, plump ripe red fruit with good volume, slightly less tension than I would like. This was apparently harvested a little earlier than others, although I might have even have got the vendangeurs out a day earlier? This is one cru where I harbor much fonder memories of the 2015. The 2015 Corton Clos Rognets Grand Cru has a tightly-wound bouquet with a vein of grey slate permeating the red berry fruit. The palate is medium-bodied with firm tannin in the mouth, quite grainy in texture with a strict, quite linear finish, hints of hoisin just lingering on the aftertaste. There is good energy here and it should gain more cohesion by the time of bottling, and may possess the longest aging potential. 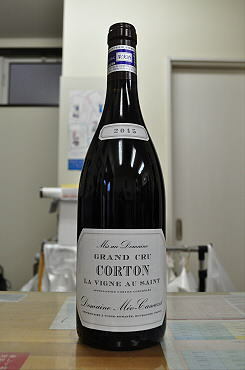 The 2015 Corton La Vigne Au Saint Grand Cru has what you might describe as a "cool" bouquet with expressive mineralite and very impressive terroir expression. There is class and sophistication wafting from the glass here, aromas that place you right up on that famous hill. The palate is medium-bodied with supple tannin, well-judged acidity, bright red cherry and strawberry fruit with a chalky texture on the persistent finish that leaves the tongue tingling with latent energy. This is a superb offering and should not be overlooked by those who normally associate Meo-Camuzet with all things "Vosne-shaped".